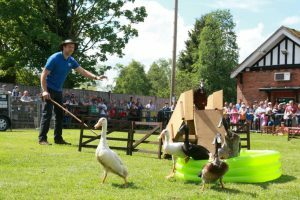 Reaseheath College held their annual Family Festival on Sunday 13th May, with a record number of visitors; it has been crowned their “best ever” event since its launch some 22 years ago. The action-packed festival, held on the college’s Nantwich campus, offered hundreds of fun activities and displays for record-breaking crowds in a day of perfect spring sunshine. A team from Dial West Cheshire were there to support arrangements for disabled access. Our presence provides a valuable service for disabled people attending the event. Our ‘mobility stand’, located close to the blue-badge parking area, was manned all day long in the beaming sunshine providing free hire of mobility scooters, wheelchairs and other equipment. “I am so grateful for the use of this scooter without which I would not be able to attend this event”, said a very satisfied visitor. Throughout the event, we helped approximately twenty guests and their families and friends, enabling those who otherwise would have had difficulty with mobility to fully enjoy their day. This service is invaluable for guests with disabilities and makes a real difference to their comfort and enjoyment of events. If you would like to discuss making your event accessible for everyone, please get in touch with us here.